This is one of our large size gaiwan, it is easier to use for individual service. If you want to pour out your tea, it will be a little more difficult for someone with smaller hands because it can be very hot. Since this gaiwan is made of porcelain, it is good for brewing any kind of tea because you can easily wash the flavor of any tea from it. Blue is a classical color that was very popular to accent white porcelain in the Ming Dynasty. This gaiwan is delicately hand painted to depict a large peony flower and magpie birds. The characters (right to left) read “Hua Kai Fu Gui” which translates to “when flowers open great fortune comes to you.” According to Chinese culture, peony flowers represent a rich and colorful life. The word for magpie is “xi que,” “xi” means happy, “que” means bird. When someone mentions magpie birds, it sounds like someone is wishing you happiness. When you sip your tea, the artist gives you wishes of good fortune to accompany you, as the tea leaves open inside your gaiwan like flowers, Chinese believe good fortune will come to you. This is made of very good porcelain named “De Hua Ci,” from one of the famous porcelain regions, De Hua in the center of Fujian Province. This region has been famous for producing porcelain since the Song Dynasty, dating back to 1,000 years ago. They are especially known for making pure white porcelain. De Hua Ci became very famous during the Ming Dynast (1368-1644), crafting their delicately carved pure white style. They use special clay from the local region, and use methods to highly control the fire inside of the kilns to produce pure white pieces. 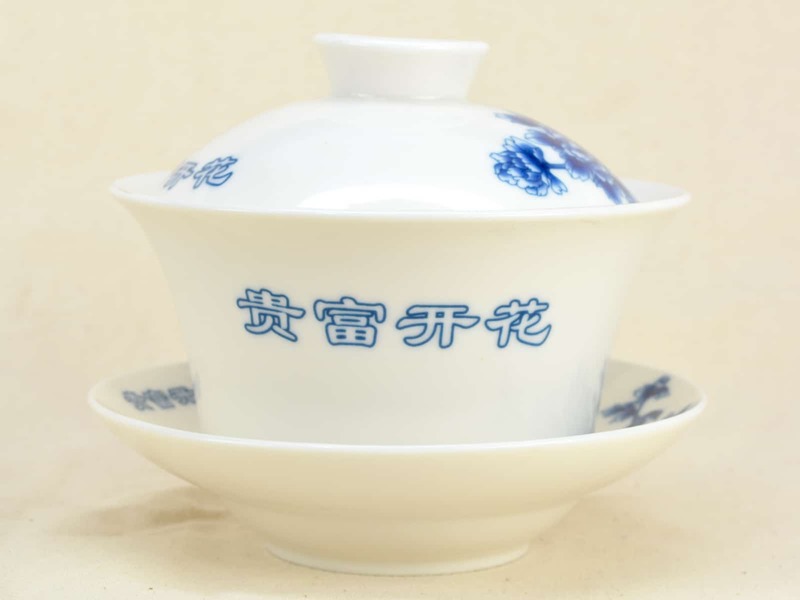 According to legend, the gaiwan was invented in Sichuan during the Tang Dynasty between 780-783. The daughter of Xi Shuan Jie Du Shu, a general, invented the first gaiwan because in the Tang Dynasty, most tea was served in bowls. She would always burn her fingers when she tried to hold the bowl, so she decided to use a wooden circle sealed with wax to hold the tea bowl in place. Later, they used paint to stick the cup to the wood. Eventually, they would indent pieces of wood so the gaiwan would stay stable, eventually adding a lid to keep it warm and the aroma close to the tea. Gaiwans are also named “san cai bei” which means three piece treasure cup. Even now, Sichuan mainly uses gaiwans for tea service. They can range from being small and delicate to a large size like rice bowls. Sichuan is where tea culture was birthed, and these cups and other traditionals eventually spilled in to other tea regions.